Over the course of the last few decades, Mac computers have become so powerful that today it is hard to think of a task that can't be completed on a Mac. Taking a screenshot has always been a simple job, despite the fact that Macs don't feature a PrintScreen button, like PCs. As a matter of fact, taking a screenshot is one of the simplest tasks you can perform on any Apple's device. There are so many different methods you can use to capture a screenshot on a Mac computer, and in this article, we are going to show you the three easiest ways to accomplish this. All you need to do to capture your first screenshot on a Mac computer is use your keyboard because it is by far the quickest way to turn your screen into a still image. How to Capture an Entire Screen on a Mac? Make sure that everything you want to include in the picture is clearly visible on the screen and simply hold the Command + Shift + 3 keyboard buttons to create the screenshot. After you hear a camera click, the image you created will be saved on the desktop as a PNG file. Select the Open With option from the Context menu, which can be accessed by right-clicking on the screenshot if you would like to open the picture in an app that allows you to share images on social media or send them via email. How to Screenshot a Portion of the Screen on a Mac? Full-screen screenshots often contain unwanted elements that have to be cropped out, so if you would like to save time on post-processing your screenshots, you can simply hit the Command + Shift + 4 keys. A crosshair mouse cursor will appear on the screen and you just have to click and drag the cursor to designate the area of the screen you want to capture. The crosshair will also display the pixel count that enables you to know who big the screenshot will be. Holding the Shift button will allow you to lock all corners of the selection rectangle, except the one you are dragging. Once you let go of the left-mouse key the screenshot will be automatically created and saved on your desktop and named Screenshot (Date +Time). Double-click on the file to open it with the Preview app and proceed to share it with your friend or colleagues. How to Take Screenshots of a Specific App Window? Launch the app and then open the window you'd like to screenshot, and then hold the Command + Shift + 4 buttons on your keyboard. As you already know this action will bring up the crosshair, and then you should press the SPACE button to turn the crosshair into a camera. Once you position the camera mouse cursor on the top of the window, your screen will turn blue, so you can check if you've selected the right window. Use the left-click to snap a screenshot and go ahead to edit or share the image. MacBook Pro owners can utilize the Touch Bar feature to take screenshots on their computers. If you don't already have a screenshot shortcut on the Touch Bar, you need to click on the Apple logo on your desktop and then select the System Preferences option. Click on the Keyboard icon, and choose the Customize Control Strip feature, located at the bottom of the screen. Once the new window pops-out you should locate the Screenshot icon and drag and drop it to the Touch Bar, and click Done. Now that the Screenshot option is available from the Touch Bar, you can simply click on its icon and take screenshots of the full screen, a portion of it, or a single window. 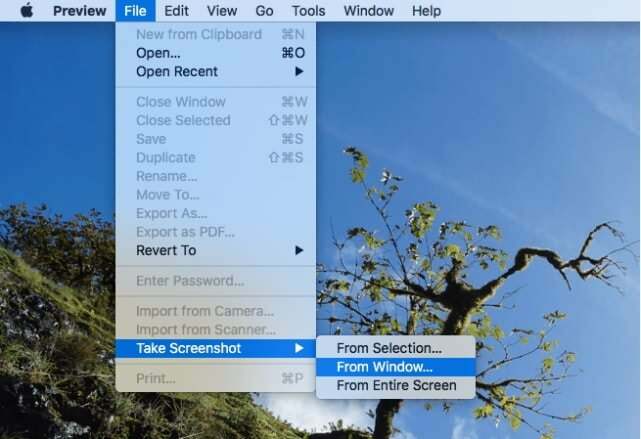 This method of taking screenshots on Mac computers is as quick and simple as using keyboard shortcuts. Open the Preview app, and head over to the File menu, where you can find the Take Screenshot sub-menu. You can either capture a full screen, a part of it you select or take a screenshot of an active window. The Preview app lets you select the destination on the hard drive where your images will be saved and you can also change the name of the file before you save it. Holding the Control button while taking a screenshot will enable you to save the picture to the clipboard and paste it into a photo editing software or a word processor. This app is bundled with all versions of the Mac OS, which means that all Mac users can access it from the Utility subfolder located in the Applications folder. The Grab is usually displayed as a toolbar, so you should just click on the Capture menu and select the option that suits you best. You can take a screenshot of an entire screen, select the region of the screen you want to capture or take a screenshot of a particular window. 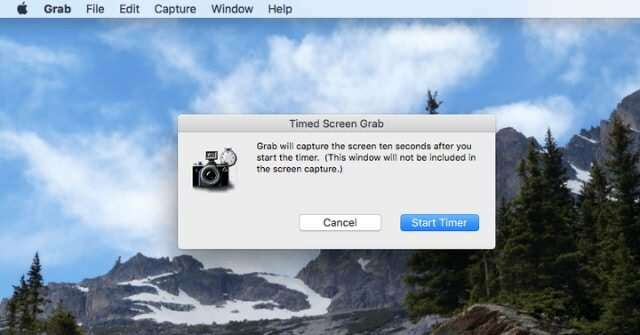 The Timed Screen feature can be used if you want to have a ten-second delay before you take the screenshot, which can be quite useful if you need time to organize the desktop before the screenshot is taken. If you would like to include the mouse cursor in your screenshots, you have to click on the Grab icon and select the Preferences option. You can then select the Pointer Type and if you want, you can also enable the sound. Mac computers provide support for numerous apps and software products that make the process of taking a screenshot effortless. If for some reason you don't want to use the keyboard shortcuts, apps like Grab or Preview offer an alternative solution. Regardless of the method you use to take screenshots, this process will not take more than just a few minutes of your time. Do you have a favorite method of creating screenshots on a Mac computer? Leave a comment below, and let us know.